Bhai Gurpal Singh was born on April 15, 1965 in the Neelowal Patti of village Bilga, situated in Tehsil Phillaur, District Jalandhar into the household of Sardar Ajit Singh and Bibi Harbhajan Kaur. Village Bilga has been honored with the blessed presence of the fifth Guru, Guru Arjan Dev Ji. When Guru Sahib were travelling from Goindwal Sahib to Mao Sahib for their marriage to Mata Ganga Ji, they stopped for three days at village Bilga. In the fifth Guru’s remembrance a historical Gurdwara Sahib is situated in the village. Bhai Gurpal Singh was a bright and cheerful child. He obtained his primary education from a Govt school in Bilga. Upon completing 12th grade at Santa Singh Secondary School in Bilga, he took admission in Guru Nanak National College, Nakodar for B.A. (Bachelor of Arts) studies. Whilst in 10th grade he became an active member, and later, the secretary at Tehsil level of the communist-influenced organization S.F.I (Student Federation of India). However, whilst doing his undergrad at the college in Nakodar he came in contact with the members of All India Sikh Students Federation (AISSF). The AISSF as an organization was considered most instrumental in inspiring the youth to walk on the path of Sikhi in those days. During his college days Bhai Gurpal Singh worked under the leadership of Bhai Parmjit Singh Malhi. He also came in contact with Shaheed Bhai Satpal Singh Dhillon, General secretary of AISSF and Bhai Manjit Singh Manna, also from village Bilga. Bhai Gurpal Singh ‘Pala’ became actively involved in the day-to-day activities of the Federation and thus an integral part of the Federation’s struggles and successes. As a politically involved and enthusiastic Sikh youth, he came into the notice of the Police. In June 1984 the Indian army attacked Sri Darbar Sahib and Sri Akal Takhat Sahib in order to decimate the Sikh struggle. During this curfew-like situation in Punjab, Police officer Jaskirat Singh of Noormehal arrested Bhai Gurpal Singh ‘Pala’ from his home with the help of the CRPF. Blindfolded they took him to an undisclosed location. The Indian state wanted to arrest all the enthusiastic and politically involved youth in a bid to subdue any opposition from the Sikh Nation. But little did it realize that people who carry the pain of each and every bullet fired on Sri Darbar Sahib and Sri Akal Takhat Sahib in their hearts will never rest. The family learned after several days that Bhai Gurpal Singh was being illegally detained at the military hospital in the Jalandhar camp along with countless other Singhs. About a month later he was presented at a court in Phillaur. Eventually he was released after his father paid for his bail. On February 2, 1986 Saroops of Guru Granth Sahib Ji were burnt at Shri Guru Arjan Dev Gurdwara, Nakodar. The AISSF and people of the area observed a protest march in Nakodar city peacefully to show resentment against this and for the arrest of culprits. But the Police instead of arresting them gave them Police protection. On February 4, 1986 Baba Joginder Singh, state leaders and members from almost every unit of Punjab belonging to the Federation along with local residents gathered in a great strength outside Nakodar city at Sherpur bridge side. It was decided that the Sangat (congregation) would proceed to the Gurudwara, led by the Panj Pyare to retrieve the Saroops of Guru Granth Sahib Ji, which were burnt by anti social elements so that they may be taken to Kiratpur Sahib for their last rites. The Panj Pyare were leading the Sangat reciting Satnam-Vaheguru, as they started to move toward the Gurdwara, the Police firstly start moving backward but when the Sangat reached near the municipal corporation post, without warning began firing on the unarmed protestors. Bhai Ravinder Singh, Bhai Baldhir Singh Fauji and Bhai Jhalman Singh who were three of the Panj Pyare were killed on the spot. The Police hunted the people running back, about 15 young men where further injured, a few young men jumped into wells to protect themselves from the Police. Few headed into nearby fields and about 30 were arrested by the Police. Bhai Harminder Singh, president of Khalsa College Jalandhar unit of the Federation was arrested in the presence of people from the saw mill of Natha Singh. Jaskirat Singh (SHO) shot him in the mouth with revolver after telling him that you have made many speeches with this tongue, today we will stop it forever. After this police took the bodies of the 4 Singhs to the mortuary house of Nakodar Civil Hospital and ordered for their postmortems, however Bhai Harminder Singh had actually survived from the gunshot wound. As preparations were being made to operate on Bhai Harminder Singh, the police swiftly came with a van and ordered to refer Bhai Harminder Singh to the Civil Hospital Jalandhar. En-route to the hospital at village Lambra on Nakodar to Jalandhar road the Police again shot Bhai Harminder Singh and this time killed him. In Police reports the place of death was shown as Civil Hospital Jalandhar. Bhai Gurpal Singh ‘Pala’ was present at the Nakodar encounter and was a close companion of Bhai Jhalman Singh. Witnessing the martyrdom of his companions further infuriated him against the brutality of the Indian state. In these days the Sikh youth began striking back, the Kesri (saffron) revolution began punishing the brutal opposition one-by-one. Whoever came in the way of blessed path of attainment of Khalistan, was finished off by the Jujharoo Singhs. The Singhs who had given away the comforts of their home, to sacrifice their life for the well-being of the Sikh Nation were held in high respect by Bhai Gurpal Singh ‘Pala’. He considered the service of these Singhs, such as to provide them with food and shelter, and to help them in any possible manner as his foremost duty. Bhai Gurpal Singh ‘Pala’ was becoming a thorn in the side of the Punjab Police, therefore Policeman Gajjan Singh of Nasrake (Gurdaspur) arrested him for the possession of an unlicensed pistol. The Police heavily tortured Bhai Gurpal Singh, tearing apart his legs, and crushing his legs with a heavy roller. He was seriously injured as such that his family provided for his medical expenses worth hundreds of rupees each day. When police could not extract any information out of him, they sent him to the Central Jail in Jalandhar through court proceedings. During his jail time he came in contact with Dr. Barjinder Singh Panjwar who was the Federation leader in the Majha region. About three months later he was released on bail. His father Sardar Ajit Singh was also tortured at various places including CIA Staff Jalandhar and the Police post at Noormehal. Upon release Bhai Gurpal Singh ‘Pala’ came in close contact with Bhai Gurnek Singh ‘Neka’ aka Baba Hari Singh – Lt. General of the Khalistan Commando Force (KCF); famously known for his role in the assassination of vulgar singer Chamkila. Operating under the guidance of Bhai Gurnek Singh ‘Neka’ was Bhai Gurdeep Singh ‘Deepa’ Heran Wala. Bhai Gurpal Singh became acquainted with Bhai Gurdeep Singh ‘Deepa’ and often provided shelter for their unit at his home. Bhai Gurpal Singh provided the Jujharoos with food, clothing and shelter. On the other hand, the Punjab Police provided their touts with alcohol, drugs and cash incentives to obtain and report back information of those harboring the Singhs. Despite the Police being aware of the safe haven offered for the Jujharoo Singhs and conducting regular raids on Bhai Pala’s home the Police forces were never successful in capturing a single Jujharoo. Bhai Gurpal Singh ‘Pala’ never went underground and was arrested on several occasions. The infamous Police officer Swarn Ghotna used to interrogate him often at CIA Staff Jalandhar. In the name of interrogation Bhai Gurpal Singh was inhumanely tortured. Swarn Ghotna was the loyal servant of SSP Suresh Arora, at his behest Ghotna would torture Bhai Gurpal Singh till unconsciousness but the determined Singh would not utter a word of information about his companions. Thanedar Harmail Singh from Noormehal also detained Bhai Gurpal Singh under his authority and began to torture him for information regarding the ammunition of KCF Singhs and the whereabouts of Bhai Gurdeep Singh ‘Deepa’. On each occasion the Police where unable to extract a shred of information from Bhai Gurpal Singh and were forced to release him. However, Harmail Singh was a power hungry officer who indulged in the killings of innocent Sikh youths in order to reap cash rewards, soon after he was rewarded with a promotion to DSP of Phillaur for killing Bhai Manjit Singh ‘Billa’ (KCF). The sacrifice of Bhai Manjit Singh had a profound effect on Bhai Gurpal Singh, such that he did not eat for many days upon hearing the news. Bhai Gurpal Singh returned home but did not shy away from his Panthic responsibilities, he was highly respected within the militant circles for his pleasant nature and everybody took his advice seriously. The KCF held a meeting under the command of Bhai Gurdeep Singh Deepa at the farm of Bhai Gurpal Singh Pala. Here plans were made to kill the prominent Communist leader Sarwan Cheema, who served as a police tout and used to issue challenges to the Jujharoo Singhs. In completion of this task Sarwan Cheema along with his five bodyguards were fired upon and shot dead, talk in Police circles was that “He was fired upon by Deepa, but it was Pala’s brain behind this assassination”. Sarwan Cheema’s assassination sent shivers down the spine of Indian forces. Police officers were now afraid of going near the house of Bhai Gurpal Singh. They knew fully well that they could be meted out the same treatment that was given to Sarwan Cheema. Bhai Gurpal Singh’s association with Jujharoo Singhs, along with his own intelligence and dynamism had frightened the Punjab Police. Bhai Gurpal Singh fearlessly continued in serving the Jujharoos, whenever the Singhs approached Bhai Gurpal singh, he would provide them with every possible help. The Police and their touts were looking for ways in which they could capture Bhai Gurpal Singh without alerting any of his companions. 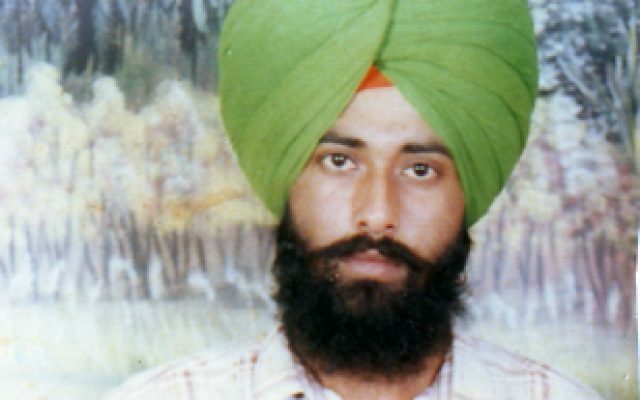 On March 14, 1992 on the tip-off from an informant Bhai Gurpal Singh was apprehended from Nakodar bus station. The Punjab Police with the help of CRPF shot Bhai Gurpal Singh Pala. He spilled his blood to further the cause of Khalistan. The Police took Bhai Gurpal Singh to the hospital to remove the bullet before taking him to an undisclosed location where he was tortured and martyred. Bhai Gurpal Singh ‘Pala’ did not waver from the path shown by Sant Jarnail Singh Khalsa Bhindranwale and gave away his life walking on this path. His Shaheedi (martyrdom) will serve as an inspiration until the Indian tricolor is replaced by the flowing Nishan Sahib of the Sikh nation – Khalistan.